Gay Talese, in his timeless, beautifully tailored, custom suit, stares and smiles from the cover of his book, A Writer’s Life. He published an essay in the August 2007 issue of Vanity Fair about the endangered custom tailor. In this piece he writes that he spends upwards of $3,000 on one suit and he buys dozens at a time. I have another take on a writer’s life: this twenty-seven-year-old writer in particular. As I compose from my one-bedroom apartment, it’s December in upstate New York and I can see my breath at my work desk — a card table that wobbles with every key strike. Electric heat is far too expensive, so the thermostat is locked at 55 degrees to ensure that my pipes do not freeze. use scented candles for aroma but also to warm up my hands from the metallic chill of the keyboard. I clip coupons. But the key with clipping coupons is to clip only the ones on items that you regularly buy otherwise you are not saving any money. The foods I will be sick of in a matter of months or years will be quesadillas, peanut butter and jelly sandwiches, and tuna melts. As someone who loves to cook, it pains me to make boxed macaroni and cheese. But I do, and to make it healthier and to save milk and butter rations, I only use the pasta water to mix just half or three-quarters of the cheese powder. I also divide portions with measuring cups to keep me from overeating, but it also stretches my food so I may spend, on a given week, no more than $25. hypotenuse and walk to them all so I do not have to start my car except to leave. Before I reach the register, any register, I ask early and often do I need this? Most of the time, I want it, but do I really need it? The answer is often no. On the two days a week that I treat myself to a cup of Dunkin’ Donuts coffee, I make one medium cup of French vanilla with cream and sugar stretch for two, sometimes three days by taking baby sips and savoring every single drop. Price Chopper, and redeemed them for a whopping $5. At work, I’m one of the few people who like to wear suits, shirts, and ties. The publisher is the only other person who dresses in such a way on a regular basis. I like to look sharp, especially in a sports department where sweatshirts and jeans are the norm. I cloak my pauper lifestyle with a wool Versini suit, white shirt, and patterned tie. But when I get home there’s no television to turn on, just a radio I use during the day to play Metallica albums or, if I’m getting ready for work, Frank Sinatra hits. There’s nothing like fixing a Windsor knot to the tune of “I’m Gonna Live Till I Die.” As I wind down I throw on a hooded sweatshirt, sweatpants, and thick wool socks and pick up my copy of Talese’s A Writer’s Life, and internalize that wonderful, three-piece suit. 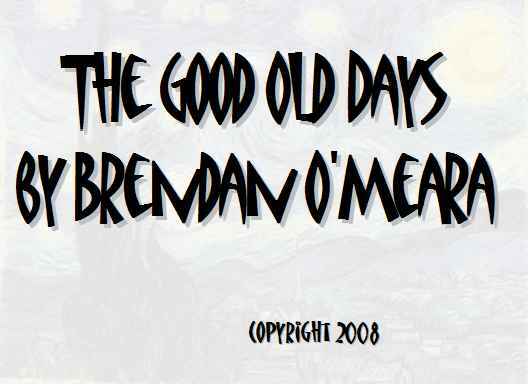 Copyright 2008, Brendan O'Meara. © This work is protected under the U.S. copyright laws. It may not be reproduced, reprinted, reused, or altered without the expressed written permission of the author.